Kalocsa, Hungary pictures, photos. 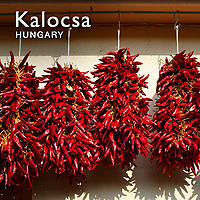 Images of Kalacsa chillis parika growing & drying to buy on line as stock photos or photo art prints. Kalocsa (Croatian: Kalo?a or Kala?a, Serbian: Kalo?a or German Kollotschau) is a town in Bács-Kiskun county, Hungary. It lies 88 miles south of Budapest. It is situated in a marshy but highly productive district, near the left bank of the Danube River. Historically it had greater political and economic importance than at present.